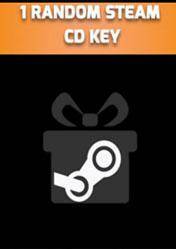 Digital code or cd key for random Steam game. This Random T cd key can contain a long list of games for Steam platform, totally random. Possible games are: Commando Jack, Chernobyl Commando, Marine Sharpshooter 2 Jungle Warfare, Street Racing Syndicate, Glacier 3 The Meltdown, Eurofighter Typhoon, Darkout, Soulbringer, Post Apocalyptic Mayhem, Primal Fears, Chronicles of a Dark Lord: Episode II War of The Abyss, AI War: Fleet Command, Hostile Waters: Antaeus Rising, Selknam Defense, Worms, Evil Pumpkin: The Lost Halloween, Speed ? ?Kills (Soundtrack Edition), Crash Time 2, Steel Storm: Burning, Retribution, Incoming Forces, Depth Hunter 2, Hyper Fighters, ... and many more. With the random key never know what game you're gonna get, so every purchase has added value because it can be totally amazing! Of course. In addition, you will never take a game that costs less than the price of the random code, it is even possible to obtain triple A games that around 30 €. Try your luck with Random key for Steam! I Bought 64 Random Game Keys on eBay for $11... Here&#39;s What Happened.